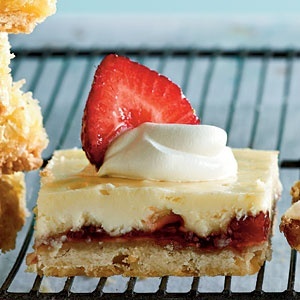 Bar cookies go glam in this sweet-tart shortbread bar treat. Cut the bars into single-serving sizes and top with a dollop of whipped cream and a sliced strawberry for top-notch presentation. 1. Preheat oven to 350°. Stir together flour, powdered sugar, and 1/2 tsp. lemon zest in a medium bowl; cut in butter with a pastry blender until crumbly. Press mixture onto bottom of a lightly greased 13- x 9-inch pan. 2. Bake at 350° for 20 to 22 minutes or until lightly browned. 3. Meanwhile, beat cream cheese and granulated sugar with an electric mixer until smooth. Add eggs, 1 at a time, and beat just until blended after each addition. Stir in fresh lemon juice and remaining 1/4 tsp. lemon zest, beating well. 4. Spread preserves over shortbread. Pour cream cheese mixture over preserves, spreading to edges. Bake 28 to 32 more minutes or until set. Let cool 1 hour on a wire rack. Cover and chill 4 to 8 hours. Cut into bars; garnish, if desired. Refrigerate leftovers. Store them in an airtight container up to 2 days.